The pharmacokinetic theory regarding chemical absorption (bioavailability) is well developed and has been applied in the pharmaceutical industry for decades. However, the commonly accepted pharmaceutical definition has not always been applied to environmental sciences, and so the definition of bioavailability is sometimes ambiguous when applied in the risk assessment process. For example, NRC (2003) offers 15 definitions for this term, drawn from dictionaries, the published literature, agency documents, textbooks, and guidance. Similarly, “absolute bioavailability” and “relative bioavailability” have multiple definitions in different documents and contexts. Below is a brief discussion of some of these definitions, together with the definition as used in this guidance; see the Glossary for additional terms used in this guidance. While definitions of bioavailability vary, all refer to the ability of a substance to be absorbed by a living organism. 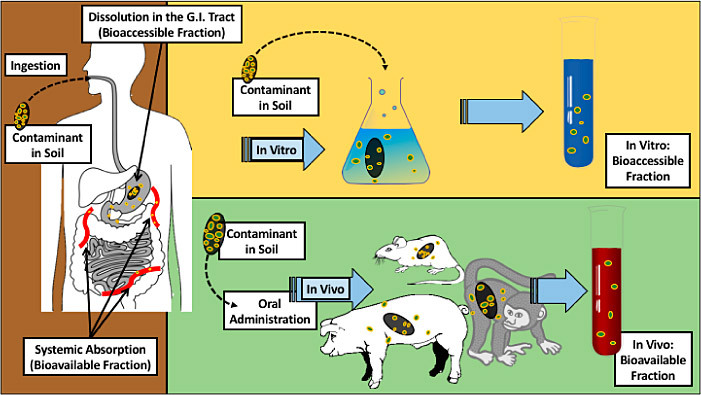 For assessing potential exposures from environmental media, bioavailability refers to the portion of the total quantity of a chemical present that is absorbed by a living organism (Klassen 2013) and reaches the central (blood) compartment, whether exposure occurs via the gastrointestinal (GI) tract, skin, or lungs (NEPI 2000). Absolute bioavailability (ABA) is the fraction or percentage of an administered dose (ingested or dermally applied) that is absorbed and reaches the blood stream. The ABA can range from 0 to 100% of the administered dose. One way to measure ABA is by comparing the area under the blood concentration curve (AUC) that results from the administered dose to the AUC that results from the same dose if given intravenously. This term refers to the comparison between the bioavailability of a chemical administered in different dosing media. For use in the human health risk assessment of chemicals in contaminated soil, the relative oral bioavailability (RBA) refers to the ratio of the absorption of a chemical from soil, relative to the absorption in the exposure medium used in the critical toxicity study (the study that forms the basis for the cancer slope factor or reference dose). This critical distinction is central to the concepts that are addressed in this guidance. Using a site-specific RBA in the risk assessment process accounts for potential differences between the bioavailability of a chemical studied to determine the dose-response relation (in the toxicity study) and the bioavailability of that same chemical from environmental media. The RBA is generally less than the ABA, but theoretically could exceed the ABA (the RBA could be greater than 100%) if the absorption from environmental media is higher than absorption in the critical toxicity study. The term “bioaccessibility” refers to the fraction of the total amount of a chemical present that is potentially available for uptake by an organism. In this guidance, this term refers to the results from chemical extraction tests that have been developed to simulate or predict the RBA of chemicals from soil. In this context, “bioaccessibility” is interchangeable with “in vitro extraction testing,” wherein experimental systems have been developed to assess the potential for human exposure to chemicals in soil by capturing a critical component that affects bioavailability. Figure 1-2 illustrates the terminology used in this document. Figure 1‑2. Illustration of terminology.